+ You don’t actually have the confidence to put yourself out there because you don’t (yet!) wholeheartedly believe in your mission. + You find reasons and excuses not to take action and stay in hiding. + You dim yourself down and don’t position yourself as an expert/leader in your field. All of this means that you aren’t making the IMPACT you’re meant to. And you aren’t being COMPENSATED for your gifts, talents and skills and earning an INCOME. + What moments of my story are relevant ? + How do I share it in a compelling, memorable, persuasive way? + How do I share it in a way that makes an impact ? + Where do I share it? + How do I embody it, and channel my passion and energy into what I am teaching? THEN YOU'RE STUCK IN LIMBO LAND - A PLACE OF ZERO GROWTH, SOUL SUCKING INDECISION, AND TOTAL DENIAL. Good news, I'm lighting the path OUT. Claim your 1 Month Brand Story Intensive, and Let’s Stop the Self-Sabotage Cycle! 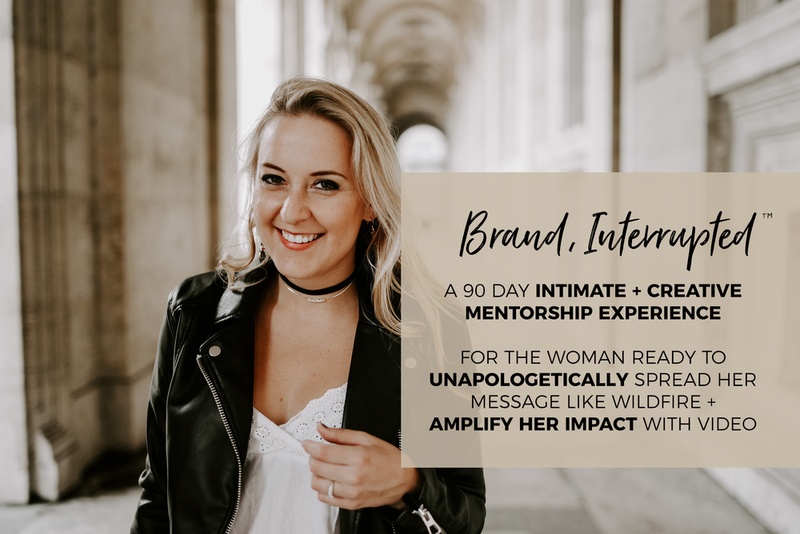 My 90 day BRAND, INTERRUPTED MENTORSHIP is 👌👌 when you know that you're ready for some full-throttle, long-term support - I've got you. Hop on a call and we can talk about it. I see you, I feel you, I know you. It literally was my god-given gift to tap into people’s essence, their story, and pinpoint who you are and what makes you so unique - so that you can then translate that into sales, impact, and meaningful work. You know your WHY. Let me show you HOW. BOOK YOUR COMPLIMENTARY CALL WITH ME TO SEE WHICH PACKAGE IS RIGHT FOR YOU! It’s time to make Brand Story Magic!